Haiti’s farmers live in a country that is among the world’s most vulnerable to climate change. Increasingly unpredictable and severe weather events — such as intense tropical storms, floods and droughts — threaten agricultural productivity in a country where more than half of the population is plagued with chronic food insecurity. Haiti’s challenge is particularly acute: The majority of the country’s population depends on small-scale, rainfed farming to survive, and yet most Haiti’s farmers receive little or no climate information and guidance to adapt to more variable rainy seasons, dry spells and temperatures. Haiti seems all the more vulnerable when you consider the Caribbean country lies in the middle of a hurricane corridor as the warming planet provides more fuel for extreme weather. In fact, Haiti ranked as the second most-affected by extreme weather events in the period 1996-2016, according to the latest Global Climate Risk Index developed by the nongovernmental organization Germanwatch. 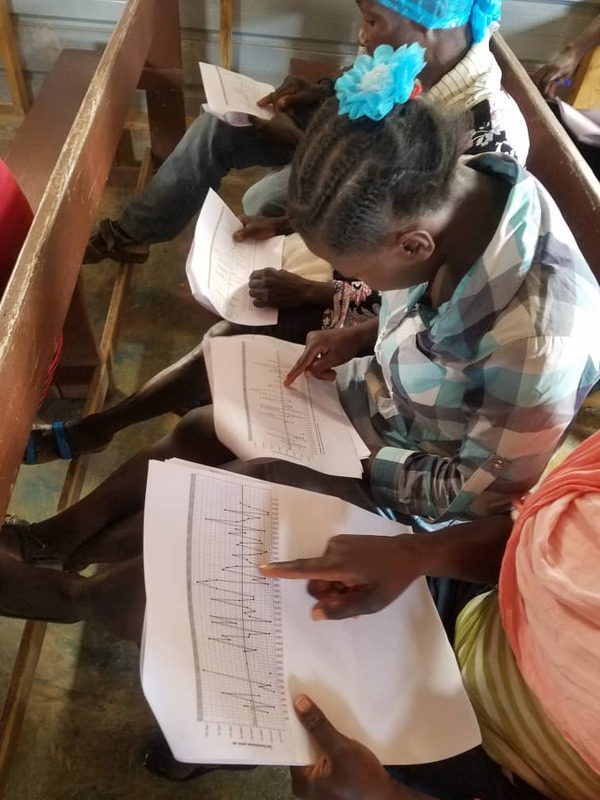 In December 2018, researchers with the UF/IFAS-managed AREA project launched the innovative program known as PICSA, or Participatory Integrated Climate Services for Agriculture, which combines historical climate data and weather forecasts with farmers’ knowledge of what works in their local communities to increase their resilience. The idea is simple enough: By providing farmers with participatory tools and critical information, such as historical probabilities of the start and length of the growing season and the likelihood of above or below rainfall during the upcoming season — all of which vary considerably from year to year — they can make more informed decisions. For example, armed with location-specific weather data and locally relevant options, a farmer may estimate how likely she is to lose her maize harvest because of insufficient rainfall in a given year. Knowing that, she could choose to plant less maize and a more drought-resistant crop, such as sorghum. 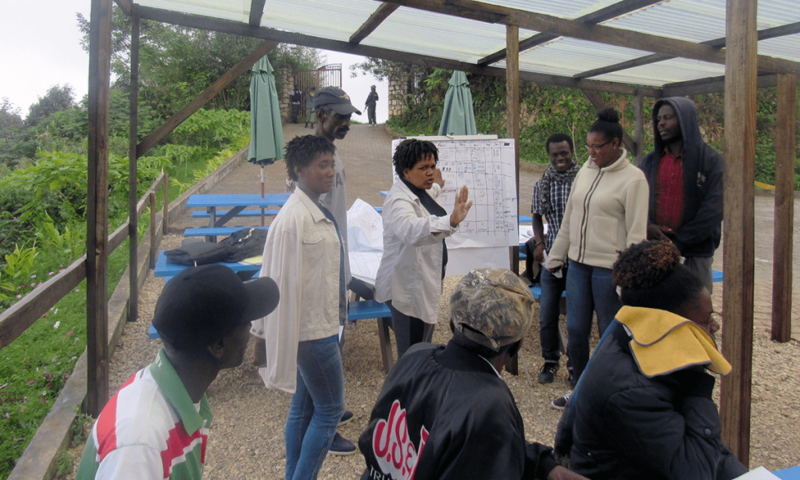 The approach was developed by researchers at the University of Reading in England, which AREA recruited along with meteorologists with Haiti’s Meteorological and Hydrological Service (UHM) to roll out PICSA trainings to Haitian farmers for the first time. Calculate probabilities and risks for the start and length of the agricultural season and the amount of rainfall. Interpret seven-day and three-month rainfall and temperature forecasts. Develop a matrix of their options — such as growing alternative crops or raising livestock or even changing their livelihoods. 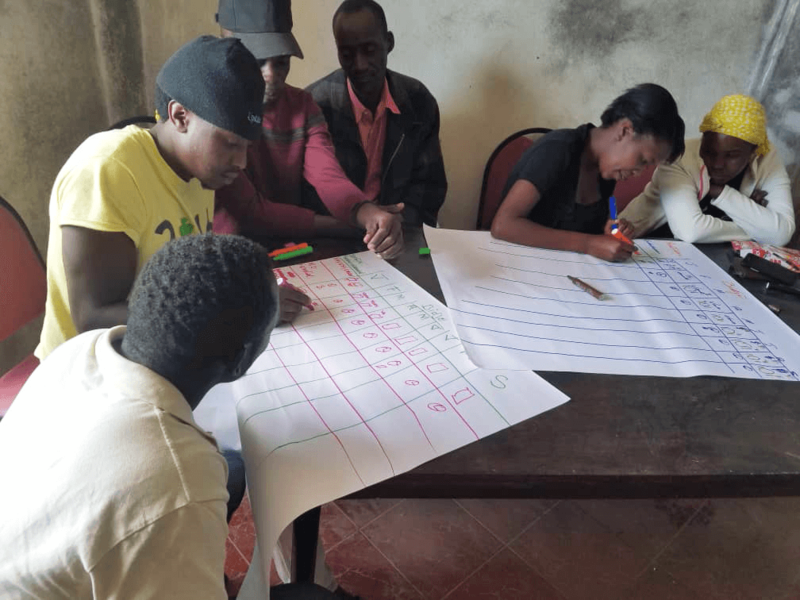 Produce participatory budgets to evaluate and select those with the highest chance of profit or the lowest risk of losses in above and below normal rainfall years. 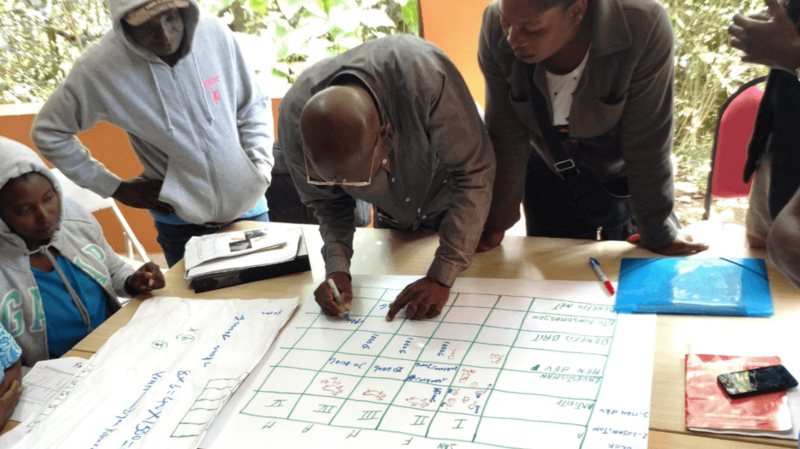 Finally, they leave with their own personalized resource maps, seasonal calendars, forecasts and a list of options they can use in the growing season to reduce climate-related risks, improve yields and increase incomes. Participating farmers represent a diverse cross section. They may live in widely varying geographic conditions, from sea level to high elevations on what is the Caribbean’s mountainous country, and while some say drought has been their biggest problem, others say it’s too much rain. Some grew up on farms, while others are relatively new to agriculture. But they all recognized they are at risk from more extreme and varying wet and dry periods, plus the impact of major storms such as Hurricane Matthew, which caused widespread destruction of crops in southern Haiti in 2016. “From my experience, if the climate continues to change as it does now, this will make things harder for us,” lifelong farmer Laurent Pierre Jean Robert said in Haitian Creole. He is president of a farmers association called Union Citoyen pour le Developpement de Grand Fond and he attended the first five-day PICSA workshop in December, which was held in Kenscoff, a mountainous rural area southeast of Port-au-Prince. Illustrating the high risks farmers face every growing season, Robert said during the first half of 2018 his crops were destroyed because of a lack of rain, but he was able to harvest a second crop because the rains started in September. Like most Haitian farmers, Robert has no access to irrigation and must rely exclusively on rain to water his crops, which include beans, lettuce and potatoes. The facilitators of the inaugural training were AREA staff members and agronomists, weather experts from Haiti’s Meteorological and Hydrological Service (UHM) and Graham Clarkson, a senior research fellow at the University of Reading and co-developer of PICSA. Clarkson, who has trained smallholder farmers in developing countries such as Ghana, Malawi, Rwanda and Tanzania, said he was impressed with the enthusiasm of the attendees to share what they learned. “Participants could see the value of the approach and were keen to implement what they had learned with their farmer groups,” Clarkson said. Since she was trained, Case Marthe-Dala Abraham, a leader of the Association of Organic Vegetable Producers in Kenscoff, has trained several groups of farmers in the approach. In contrast, Raymonde Moise, president of the Association of Female Peasants of Furcy, has been farming since she was 12 when she accompanied her parents to the field and learned to help manage a successful farm. She now grows potatoes, maize, cabbage and peas on about three acres. Learning new techniques and using smarter planning tools may make all the difference between success and failure, she said. Abraham agreed. She said farmers can learn much from each other as they search for ways to adapt to the changing conditions. “I think if farmers are sensitized to climate change, they can face the climate change,” she said. By introducing this training to farmers and farming association leaders, AREA’s research team is hoping to do just that, and to make farming more sustainable in a country faced with the ongoing challenge of feeding its people. I welcome you to follow me on Twitter @staub_caroline. And, feel free to comment on the story below. — Contributors: Charles Boisseau, communications manager of the AREA project, edited the story and Anne Gilot, measurement and evaluation specialist, interviewed farmers in Haitian Creole. Caroline Staub, PhD, is research coordinator and co-leader of the Smart Climate Solutions program for the UF/IFAS-managed Feed the Future AREA project.